The Starter Sushi Set arrived by courier, boxed in a relatively flimsy, yet securely sealed and intact cardboard box, which itself was packed in a plastic mailing bag. There were several items, all neatly packed, well-wrapped in the case of bottles and breakables, including all the basic ingredients for creating sushi delicacies, including wasabi, ginger, sushi rice, seaweed; this kit does NOT contain fish – as sushi requires fresh fish, and everyone has different tastes, you will need to purchase your choice of fish on the day you intend to prepare sushi. Also included were sets of chopsticks, a bamboo mat for rolling out handmade sushi, and a full-length, hard backed book detailing not only suitable recipes for sushi, but also a history of sushi, and the training of sushi chefs. At first glance, there was everything that might be needed for even inexperienced novices to begin exploring the creation of sushi in their own home, while a brief first glance through the book suggested that it would not only provide sufficient instruction in basic sushi-making, but would also stimulate the urge to innovate, along with suggestions as to how this innovation might proceed. Kit included everything necessary to experiment with creating basic, traditional sushi; you will need to buy your own fish, but that's understandable, as everyone's tastes differ, and sushi fish needs to be fresh. As long as you're not expecting a professional-kitchen standard set of utensils, or a wide range of ingredients there's nothing to complain about. Sushi; taste and technique (Kimiko Barber & Hiroki Takemura, ISBN 0-7513-3699-8) is a book about far more than sushi: it is a story of a cuisine and a culture, with a dash of autobiography. Hiroki Takemura is a well-respected sushi chef, and the second introductory chapter, 'A Sushi Chef's Training', provides an eye-opening narrative of Takemura's personal journey from rural Japan to the height of his profession. Anyone who thinks their job is hard, and their boss too demanding, might think again after learning that, as an apprentice, Takemura spent almost a decade merely assisting the master chef in general work, before he was even permitted to stand beside him at the chopping board as the sushi was being prepared. The book is detailed and instructive, without overwhelming the reader with technical terminology, or leading a newcomer to the world of sushi making to feel completely out of their depth. The narration is light and easy to read, with plenty of good quality colour photographs to break up the text. Perhaps unusually for a book about food, the sushi recipes come towards the end: however, once you understand the history, culture, and background, not just of the art of creating exemplarly sushi, but of Japan itself, this placement of the recipes as the final part of the book makes perfect sense. Following the recipes for traditional sushi are suggestions on innovations around the core concept of sushi, and advice as to what other food and drink could be served with sushi as part of a dinner party or other form of at-home entertainment. The book is hardback, giving it an attractive appearance, and meaning it should stay in good condition for many years to come. As with most recipe/food related books, it would be helpful if details of online sites where specialist equipment and ingredients could be purchased: not everyone lives in a diverse, multicultural metropolis, and, when buying such things online, it can be difficult to judge quality. 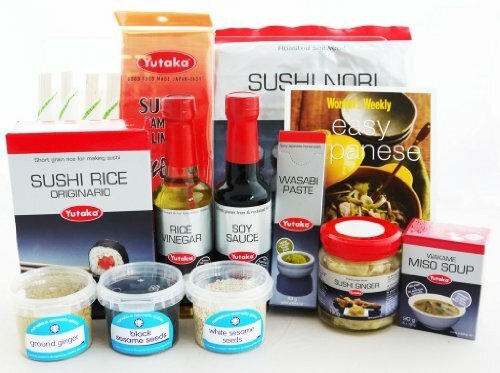 While the sushi starter kit provides you with the basics for making and enjoying simple sushi at home, if you intend to delve further into the sushi world, you may want to invest in some specialist equipment, although this is not necessary, as sushi can easily be prepared using standard kitchen utensils. I personally have a very small (10ft x 3ft) kitchen, and no specialist equipment of any kind; I was able to make sushi very easily with the basics of a cheap sieve, and a single saucepan. 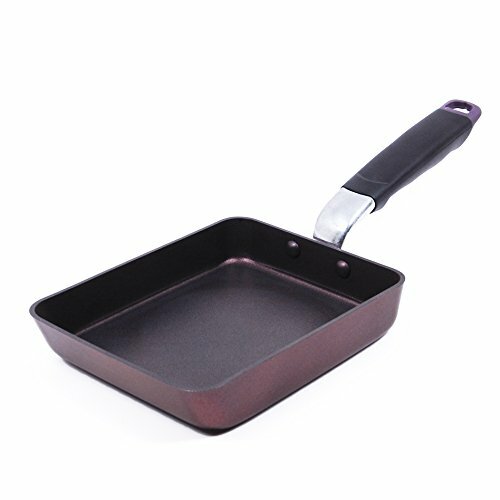 Japanese omelettes are made in deep, square pans. This creates an omelette which is easy to cut into smaller segments, and wrap in nori, or serve on top of sushi rice. Sushi molds help ensure that pressed sushi holds its square shape. The mold will need to be soaked in cold water before use, to keep the rice from sticking to it, and will need to be thoroughly dried after use to prevent decay of the wood. When you're working with fresh fish, you need to be able to quickly and easily remove the scales from the fish without damaging the flesh. 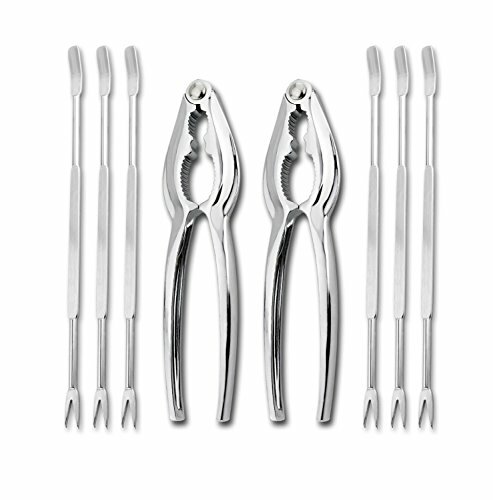 A fish scaler enables you to do just that. 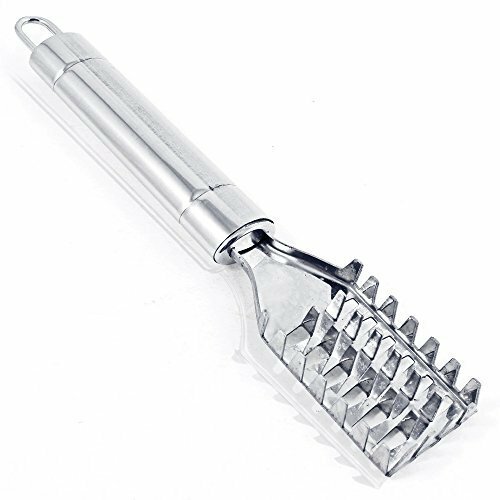 If you intend to use lobster, crab, or other shellfish in your sushi, these are invaluable, allowing you to quickly and easily crack open claws and shells, and extract the choicest meat. For the purpose of creating 'review' sushi that was likely to appeal to the majority of tastes and budgets, I used canned tuna to create sushi rolls, along with the ingredients in the sushi starter kit. Technically cheating, but, as long as you make sure to drain your canned fish thoroughly, it can work just as well – and may be more appetizing to those put off sushi by the idea of raw fish. Making the sushi was actually fairly simple: I cut down the cooking time of the sushi rice, as I do with all rice, by simply starting it off with boiling water added from the kettle, rather than bringing cold water to the boil. The eventual taste didn't seem to have been affected by this slight deviation from the instructions! One slight hitch that we encountered was that the book stated that the rice vinegar mixture should be heated separately to the rice – we only have one saucepan, so it had to be added to the rice as the latter came to the boil. Again, the eventual taste didn't appear to have been affected. Making sushi rolls by hand is very simple indeed: lay out the bamboo mat, lay a sheet of nori (dried seaweed) on the mat, spread the rice (which should be hot and sticky from cooking) over the seaweed sheet (it's best if you use the back of a spoon, or a rice paddle for this), and then add your ingredients – in my case, canned tuna, with sesame seeds, poppy seeds, and sliced ginger from the sushi starter kit – in a line across the center of the rice. Fold the seaweed sheet in half across your filling, fold the bamboo mat in half, and then roll the mat tightly and firmly: rolling widthways (as I did) produces a thick, chunky roll, which can easily be cut into separate, smaller rolls. I cut it into four, and my wife and I had two large pieces each, but it could easily have been cut into at least eight pieces. Doused liberally with soy sauce, in my case – Morgana thinks I'm mad for liking the stuff! - the resulting sushi was incredibly tasty, with a sweet-and-sour tang, and a fresh edge, that you just don't get from the supermarket snack packs. There is plenty of seaweed, rice, and other ingredients left, so Morgana and I will certainly be continuing our adventures in sushi! Yes, you'll have to purchase the fish, or other fresh ingredients, separately, but, otherwise, everything's there, and there are sufficient ingredients to make several batches of sushi, and in different styles. Worth the money, and a good gift to give to someone going away to college for the first time – it's bound to help them make friends!